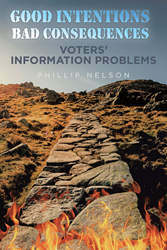 Author Phillip Nelson, Ph.D., is an Emeritus Professor of Economics from Binghamton University and has released his latest book, “Good Intentions – Bad Consequences: Voters’ Information Problems,” which is a conservative’s innovative guide to understanding voter behavior. The book provides evidence of a conflict in a Democracy between two main voter motivations and the implications of that conflict for redistributional and environmental policy. First, some voters want to “do good” but are unaware of the unintended consequences of their policy choices. Then, there is the aggregate of voters focused on their own self-interest. Nelson believes that universities are the heartland of the “do-gooders,” particularly in the humanities and the non-economic social sciences. Their liberalism is well-known. To learn more please visit Nelson’s website: Good Intentions – Bad Consequences where a more extensive overview of the book is available. Phillip Nelson received his PhD in Economics from Columbia University where he taught in addition to the University of Chicago and Binghamton University. He specialized in two fields during his professional career. The first is information economics in which he produced seminal work in consumer economics. The second is public choice in which he has written many articles and the book “Signaling Goodness.” This book melds these two fields producing new insights about voter information problems. He has spent a lifetime of teaching graduate courses in these specialties and microeconomic theory. Nelson has written countless articles published in scholarly journals and most recently with the Wall Street Journal. He is noted for having been the first to observe the distinction between an experience good and a search good.